On 30 September at a coordination meeting between the Ministry of Tourism, the Tourism Office of the province of Bali, the tourist industry and all stakeholders, held facing an imminent eruption of Mt. Agung, a joint decision was made to immediately set up the Tourism Task Force Crisis Center. The Center to be named Bali Tourism Hospitality Center, or BTH. BTH is chaired by A.A. Gede Yuniartha Putra, Head of the Tourism Office of Bali with as Deputy, the Chairman of the Tourism Industry Association (GIPI) Bali Branch. Whereas, chairing the Institutional Relations division in the Chairman of ASITA (Travel Agencies Association) of Bali, and the Communication and Support division is headed by the Chairman of the Hotel Association, PHRI Bali. Meanwhile, the Media And Data Center is tasked with the collection, management of data and publicity. The Crisis Center is tasked to collect all relevant information and data related to the imminent eruption of Mt. Agung located in East to North east Bali, and publish releases at least once daily on updated situation. Up to the minute information is to be gathered from the authorities that include PVMBG (the Volcanological Agency), BNPB (Indonesia National Board for Disaster Management), the Bali Police, the Transport Ministry Office, the Airport Authorities, and the tourist industry associations besides the Bali Tourism Institute at Nusa Dua. Until today, Monday, 2 October 2017, the Warning level of Mt. Agung has remained at its highest at level 4 (Awas-Danger) raised since Friday 22 September. But, although volcanologists continue to warn that an eruption is imminent, NO ERUPTION has (thankfully) taken place so far. 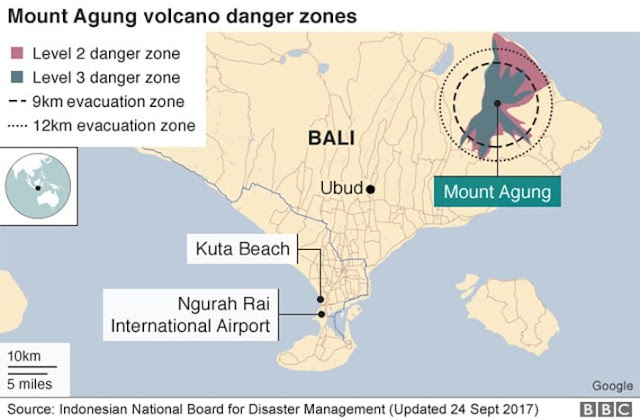 Nonetheless, the Warning is still On and all, including tourists are warned to stay away from the 12 km red zone around the crater, that includes Pura Besakih temple which is closed to tourists. This is to avoid casualties should a pyroclastic hot cloud suddenly thunder down the slopes at breakneck speed. Should an eruption occur, the authorities have already set up 6 loud sirens to warn everyone to immediately vacate the designated danger zone. The air navigation authorities have also confirmed that as soon as an eruption occurs, all planes around the aerial navigation zone should avoid the areas and will be diverted to a different route. Planes planning to land in Bali will be diverted to 10 alternative airports around Bali on other islands, depending on the direction of the wind. Aside from the area Mt. Agung located at Bali’s east to north east, all other parts of the island of Bali, such as Nusa Dua, Denpasar, Ubud, Sanur, Kuta, Seminyak and other popular resorts which are located far from Mount Agung, continue to be safe for tourists and all activities continue as usual. - In Bahasa Indonesia only.